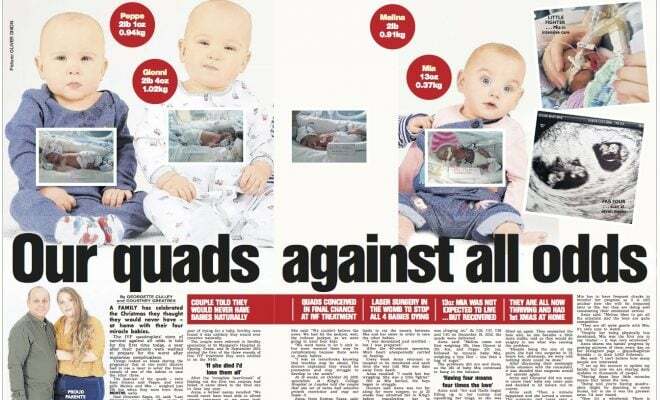 Would you like to sell a miracle baby story, or any other story suitable for magazine? Talk to the Press can help you share your remarkable story with the national press. We will help you sell a miracle baby story, or any other story, for the highest fee. It is a free service that helps you navigate the national press. Simply fill out our online story valuation form or call our team to find out how much your story is worth. There is no obligation and we guarantee the highest fees. Anna Savchenko contacted Talk to the Press after she gave birth to four miracle babies. After six years of trying for a baby and three rounds of IVF Anna and Giovanni Savchenko had almost accepted that they may never be parents. But then, just as they had given up hope, the couple from Harlow, Essex, discovered Anna was pregnant with not just one baby – but four. Last December the delighted parents welcomed their tiny identical twin boys Gionni and Peppe and identical twin girls Melina and Mia to the word. The couple were bursting with joy and wanted to share their miracle story with the world. Anna contacted Talk to the Press by filling out a story form on our website. Deputy Editor Courtney contacted her immediately and conducted a sensitive interview about her experiences. Anna emailed pictures to Courtney and was booked in to come to the studio for a professional photo shoot with the babies. She was offered a substantial fee and had the story read through before it was published. 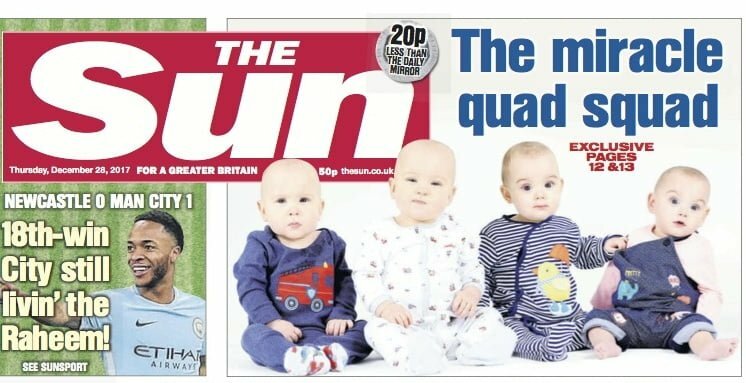 The article appeared as a double page spread and on the front page of The Sun. She was thankful to have the opportunity to tell her miracle story. Simply fill out our story valuation form to find out what your miracle baby story is worth. There’s no obligation and nothing will be printed without your permission. Talk to the Press will help you every step of the way. To learn more about how to sell a story to the press, read our Sell My Story page.